? New Orleans, Belize, Puerto Barrios, Puerto Cortes. Puerto Barrios omitted on return voyages. Admiral Sampson Boston, Port Antonio, Bowden, Kingston. Port Antonio omitted on return voyages. Greenbrier New Orleans, Bocas del Toro. Mobila New Orleans, Belize, Livingston (every other voyage), Puerto Barrios, Puerto Cortez. Return voyages: Puerto Cortez, Belize, New Orleans. Manistee Manchester, Kingston, Port Limon. Turrialba New York, Port Antonio (last call in April), Kingston, Colon, Bocas del Toro, Port Limon. Parismina New Orleans, Colon, Bocas del Toro. Zacapa New York, Kingston, Colon, Cartagena, Puerto Colombia, Santa Marta. Return voyages: Santa Marta, Colon, Kingston, New York. Sixaola New York, Kingston, Colon, Bocas del Toro, Port Limon. 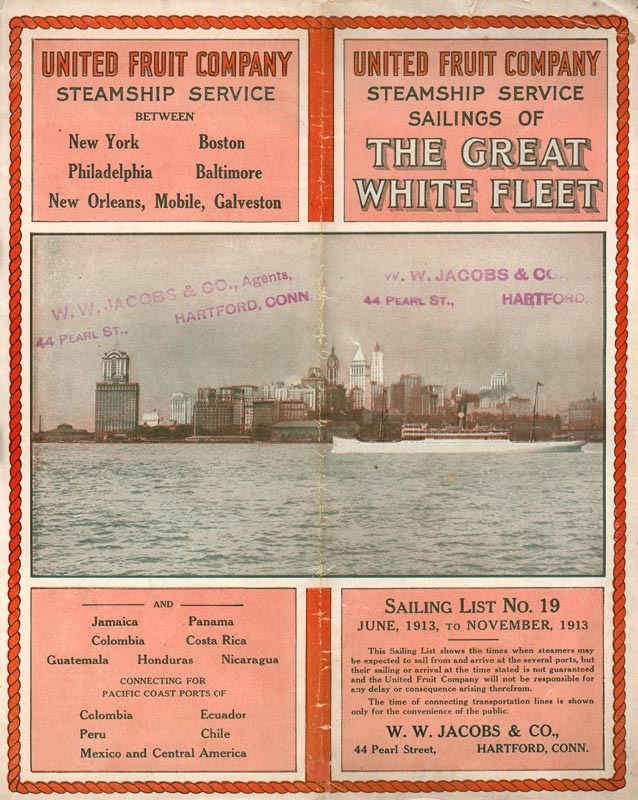 Return voyages: Port Limon, Colon, Kingston, New York. Frutera (freight only) New York, Belize, Puerto Cortez, Puerto Barrios. Retuned directly to New York. Parismina New Orleans, Colon, Port Limon. Return voyages: Port Limon, Bocas del Toro, Colon, New Orleans. Tenadores New York, Havana, Cristobal, Bocas del Toro, Port Limon. Bocas del Toro omitted on return voyages. Zacapa New York, Kingston, Cristobal, Cartagena, Puerto Colombia, Santa Marta. Returned to New York via Cristobal and Kingston. Tivives New York, Santiago, Port Antonio, Belize, Puerto Barrios, Puerto Cortez, Tela. Returned to New York via Livingston, Puerto Barrios, Port Antonio and Santiago. Heredia (two roundtrip voyages only) New Orleans, Havana, Cristobal. Called also at Bocas del Toro on return voyages. Atenas (one roundtrip voyage only) New Orleans, Cristobal, Port Limon, Bocas del Toro. Called only at Cristobal on return voyages. New Orleans, Belize, Puerto Barrios, Tela. Called also at Puerto Cortez on return voyages. Tivives New York, Kingston, Cartagena, Puerto Colombia, Santa Marta. Metapan New York, Kingston, Cristobal, Cartagena, Puerto Colombia, Santa Marta. Returned to New York via Kingston. Santa Marta New York, Santiago, Kingston, Puerto Barrios, Puerto Cortez, Puerto Castilla, Tela. Returned to New York via Kingston and Santiago. Zacapa New York, Santiago, Kingston, Belize, Puerto Barrios, Puerto Castilla, Tela. Zacapa (one roundtrip voyage only) New Orleans, Havana, Cristobal, Bocas del Toro. 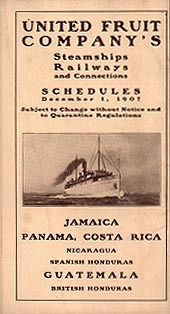 Havana omitted on return voyages. Parismina New Orleans, Cristobal, Port Limon (a few voyages), Bocas del Toro. Return voyages: Bocas del Toro, Havana, New Orleans. New Orleans, Belize (a few voyages), Puerto Barrios. Returned directly to New Orleans. Calamares (January-February) New York, Havana, Kingston (except Calamares), Cristobal, Port Limon. Kingston omitted on return voyages. Sixaola New York, Kingston, Cristobal. Return voyages: Cristobal, Cartagena, Puerto Colombia, Santa Marta, Kingston, New York. Return voyages: Balboa, Puerto Armuelles, Los Angeles, San Francisco. 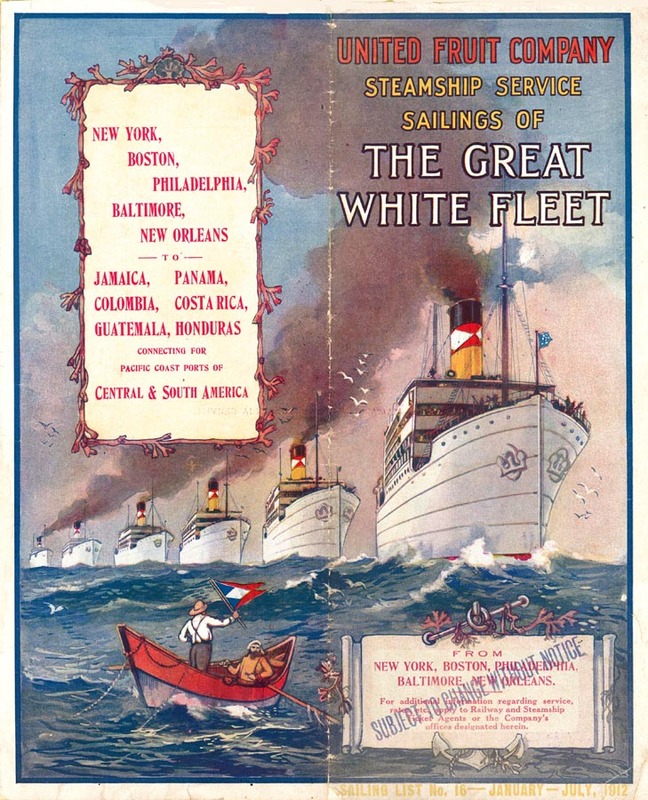 Intercoastal service via a combination of the voyages/routes above: New York-Cristobal and Balboa-San Francisco. Connecting vessels were: Veragua/Santa Marta-Talamanca and Talamanca-Veragua; Calamares (later Peten)/Metapan-Antigua and Antigua-Calamares (later Peten); Quirigua/Sixaola-Chiriqui and Chiriqui-Quirigua. Platano 1) New York, Puerto Castilla, Puerto Barrios. Returned via Puerto Cortes to New York. 2) New York, Tela, Puerto Barrios. 3) New York, Belize, Puerto Barrios. Tela New York, Puerto Barrios. Returned via Philadelphia to New York. Ulua New Orleans, Havana, Cristobal. Returned via Puerto Castilla (or optionally Puerto Cortes or Tela) to New Orleans. Turrialba New Orleans, Havana, Puerton Barrios. Return voyages: Puerto Barrios, Puerto Cortes, Tela, Havana, New Orleans. Peten New York, Havana, Kingston, Cristobal, Port Limon. Toloa New York, Kingston, Cristobal. Chiriqui San Francisco, Los Angeles, Balboa. 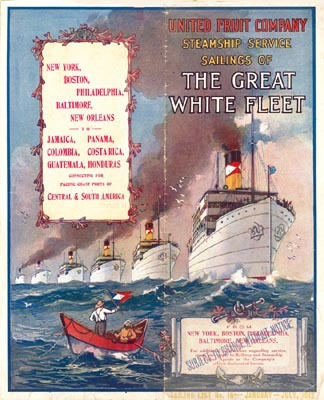 Intercoastal service via a combination of the voyages/routes above: New York-Cristobal and Balboa-San Francisco. (Transfer between Cristobal and Balboa in "Parlor Cars".) Connecting vessels were: Veragua/Calamares-Antigua and Antigua-Veragua; Peten-Chiriqui and Chiriqui-Peten; Quirigua-Talamanca and Talamanca-Quirigua. Musa 1) New York, Puerto Castilla, Puerto Barrios. Platano New York, Santiago, Puerto Barrios. Santa Marta New Orleans, Havana, Cristobal. Returned via Tela and Havana to New Orleans. Zacapa New Orleans, Havana, Cristobal. Returned via Almirante, Tela and Havana to New Orleans. Zacapa New Orleans, Puerton Barrios. Returned via Puerto Cortes and Tela to New Orleans. Ulua New York, Kingston, Cristobal. 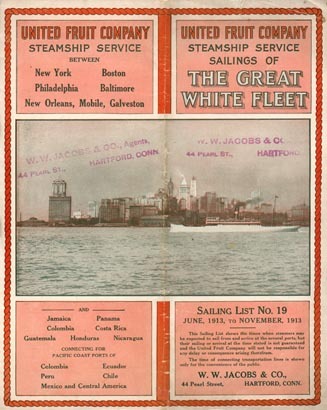 Intercoastal service via a combination of the voyages/routes above: New York-Cristobal and Balboa-San Francisco. (Transfer by rail between Cristobal and Balboa.) Connecting vessels were: Veragua-Chiriqui and Chiriqui-Veragua; Peten-Talamanca and Talamanca-Peten; Quirigua/Calamares-Antigua and Antigua-Quirigua. Musa New York, Puerto Castilla, Tela, Puerto Barrios. Sixaola New Orleans, Havana, Cristobal. Zacapa New Orleans, Belize (every 3rd voyage), Puerton Barrios. 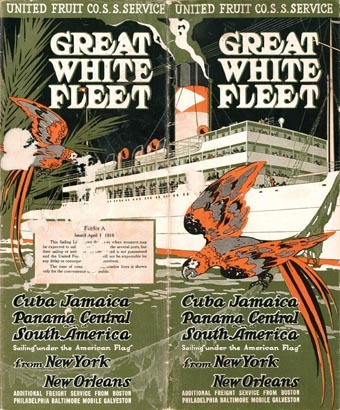 Click to view a photo of the Peten and photos of the interior of some of the ships of "The Great White Fleet"
Quirigua New York, Havana, Kingston, Cristobal, Port Limon. Talamanca San Francisco, Los Angeles, Balboa. Chiriqui San Francisco, Los Angeles, Acapulco (several voyages), Balboa. 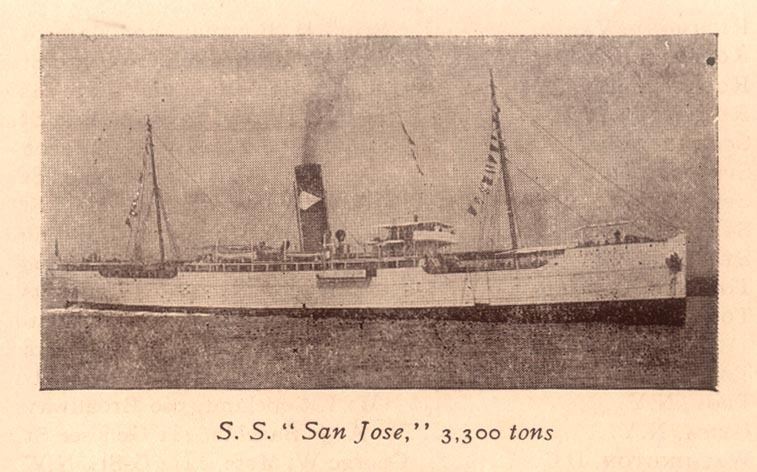 Return voyages: Balboa, Puerto Armuelles, Manzanillo (several voyages), Los Angeles, San Francisco. Intercoastal service via a combination of the voyages/routes above: New York-Cristobal and Balboa-San Francisco. (Transfer by rail between Cristobal and Balboa.) Connecting vessels were: Veragua-Chiriqui and Chiriqui-Veragua; Peten-Antigua and Antigua-Peten; Quirigua/Calamares-Talamanca and Talamanca-Quirigua. Tivives 1) New Orleans, Havana, Cristobal. Returned via Almirante, Puerto Castilla and Havana to New Orleans. 2) New Orleans, Belize (every 5th voyage), Tela, Puerto Cortes. Returned via Puerto Barrios to New Orleans. Chiriqui 1) New York, Havana, Port Limon, Cristobal. Port Limon omitted on return voyages. 2) New York, Kingston, Puerto Colombia, Cartagena, Cristobal. Returned via Kingston to New York. Antigua New York, Santiago, Puerto Barrios. Pastores New York, Tela, Puerto Barrios. Returned via Santa Marta to New York. Toloa 1) New Orleans, Havana, Cristobal. Returned via Port Limon and Havana to New Orleans. 2) New Orleans, Puerto Barrios. Returned via Tela to New Orleans. Sixaola 1) New Orleans, Havana, Cristobal. Returned via Almirante, Port Limon and Havana to New Orleans. 2) New Orleans, Belize (every 3rd voyage), Puerto Barrios. Returned via Puerto Cortes to New Orleans. Chiriqui 1) New York, Havana, Cristobal. Returned via Puerto Barrios and Havana to New York. Returned via Port Limon, Puerto Barrios and Havana to New York. 3) New York, Barranquilla, Cartagena, Cristobal. 4) New York, Kingston, Barranquilla, Cartagena, Cristobal. Returned directly to New York. Antigua New York, Havana, Puerto Barrios. Castilla New York, Puerto Barrios. Returned via Havana to New York. Toloa 1) New Orleans, Havana, Port Limon, Cristobal. 2) New Orleans, Puerto Barrios, Tela. 2) New Orleans, Puerto Barrios, Purto Cortes. Chiriqui 1) New York, Nassau, Cristobal. 2) New York, Kingston, Cristobal. 4) New York, Barranquilla, Cartagena, Cristobal. Antigua New York, Havana, Tela. Returned via Puerto Barrios and Puerto Cortes to New York. Musa New York, Havana, Puerto Barrios. Returned via Puerto Cortes and Havana to New Orleans. Veragua New York, Havana, Cristobal. Returned via Puerto Barrios to New York. Veragua New York, Havana, Puerto Barrios. Antigua (2 sailings in April only) New Orleans, Havana, Puerto Barrios. Chiriqui New Orleans, Cristobal, Tela. Antigua New Orleans, Havana, Puerto Barrios, Tela. Havana omitted onn return voyages. Returned to New York via Cartagena and Santa Marta. 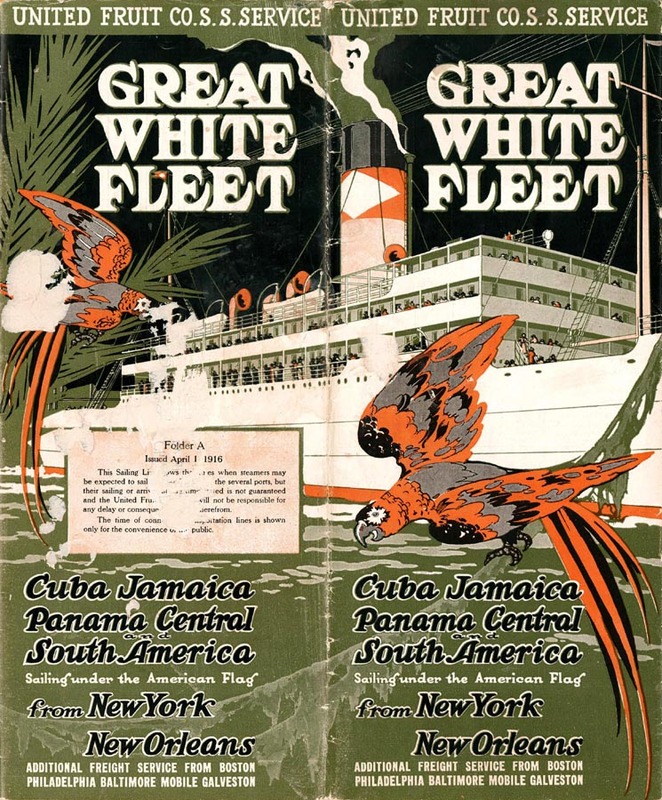 No ships are mentioned in the brochure, but according to Mark H. Goldberg's "Going Bananas" these were the United Fruit ships in service on this route. See the archives section for more brochures of United Fruit Company. This page last updated April 20, 2010.